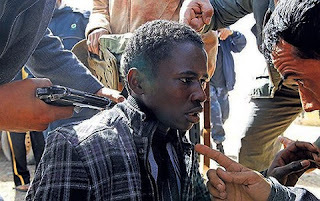 Lynchings of real or suspected Gaddafi fighters and supporters by rebels have happened throughout the war and have included racist lynchings and even beheadings of black Libyans and migrant workers. They may be continuing now they’ve taken Tripoli, even though NATO special forces and the CIA are on the ground with the rebels there. More recent reports from western journalists in Tripoli show the same is happening to black men found by rebel forces there, some of whom may have been fighting for Gaddafi, others probably just being migrant workers (The ICRC reports that Libyan hospitals have been understaffed since the fighting broke out as they were mainly staffed by migrant workers, many of whom have since fled (3)). ‘At the Maghrabi Arab Village, built for expatriates working in the petroleum industry, two young black men squatted on the ground, terrified, their hands tied behind their backs, guns held to their heads. I was told by one of the rebels that they were Mohammed Salou Mohammed, and Zait Abidan Ali, from Chad. Both had confessed to being snipers working for Colonel Gaddafi. Did they really admit to that? The fighter, looking uncomfortable, insisted that was indeed the case. Zait Abidan Ali started to say they just worked at the place. He was kicked in the chest by a fat man in torn British Army fatigues who said he was a commander and ordered me to leave. Racist killings of black people - both migrant workers black Libyans - have been common in Libya for a long time. In 2000 Libyans attacked migrant workers on a large scale, killing at least 135 of them (5). The Grendel report’ blog has posted apparent evidence from Dutch TV reports and other videos of rebels in Benghazi beating and even beheading black men. Rebels from the Shabab rebel youth movement also told Semgupta that “We shall hang all of them together when we catch him.” (them meaning either Gaddafi and his sons or possibly all Gaddafi supporters, as happened in Al Baida). When Semgupta pointed out that there was no death penalty by law in Libya the rebel answered “there is man’s law and then there is God’s law” suggesting summary execution under some rebels’ interpretation of Sharia law (6). The fact that the rebels include many defectors from the regime might mean their influence reduces revenge killings of real and suspected Gaddafi supporters or it might not. We know for certain that NATO has CIA along with British SAS and other intelligence agents and military special forces advising and training the rebels and identifying targets for airstrikes, along with Egyptian as well as Qatari and UAE special forces who may even be fighting (as they will look Arab or Libyan to foreign journalists) (7) – (14). Historically from Nicaragua to Afghanistan such “advisers” have often fought in combat or given the orders to native units they were commanding in reality. That – and NATO airstrikes supporting rebel forces during combat - mean NATO governments and militaries are so heavily involved in the ground war that they have a responsibility to ensure the rebels do not continue to summarily execute real or suspected Gaddafi supporters. Using mercenaries (euphemistically termed ‘private security contractors’) who are former special forces from their own militaries to train and give orders from a higher level to UAE, Qatari and Egyptian special forces leading units of Libyan rebels, may be giving NATO three levels of ‘plausible deniability’ on their involvement on the ground in Libya (16) – (18). NATO governments have tried to pretend that the only threat to civilians comes from Gaddafi’s forces, but NATO airstrikes and rebel lynchings are killing civilians and prisoners of war too. Of course NATO can't have complete control over rebel forces who have sometimes ignored the orders of their own leaders, but they could try to use their influence. (1) = Independent 16 Jul 2011 ‘Opposition fighters are losing battles – but winning the war’,http://www.independent.co.uk/news/world/africa/opposition-fighters-are-losing-battles-ndash-but-winning-the-war-2314575.html ; After the uprising there were repeated instances of lynchings of black men. The excuse at the time was that the men were mercenaries hired by Colonel Gaddafi. But many were innocent migrant workers from sub-Saharan Africa. Extra-judicial killings of regime officials also followed the revolution. At al-Baida, near Tobruk, for instance, 20 officials were dragged from their homes and hanged….The cases of abuse had been listed belatedly in a report published by Human Rights Watch. But no one has been investigated or prosecuted in opposition-held areas. And members of the provisional administration admit this is extremely unlikely to happen. There has been no demand from Western countries for an inquiry. (9) = Guardian 31 Mar 2011 ‘Libya: SAS veterans helping Nato identify Gaddafi targets in Misrata’,http://www.guardian.co.uk/world/2011/may/31/libya-sas-veterans-misrata-rebels ; Former SAS soldiers and other western employees of private security companies are helping Nato identify targets in the Libyan port city of Misrata, the scene of heavy fighting between Muammar Gaddafi's forces and rebels, well-placed sources have told the Guardian. (10) = Al Jazeera 03 Apr 2011 ‘Libyan rebels 'receive foreign training'’,http://english.aljazeera.net/news/africa/2011/04/201142172443133798.html ; US and Egyptian special forces have reportedly been providing covert training to rebel fighters in the battle for Libya, Al Jazeera has been told….An unnamed rebel source related how he had undergone training in military techniques at a "secret facility" in eastern Libya. (12) = Washington Post 22 Aug 2011 ‘Allies guided rebel ‘pincer’ assault on Tripoli’,http://www.washingtonpost.com/world/national-security/allies-guided-rebel-pincer-assault-on-tripoli/2011/08/22/gIQAeAMaWJ_story.html; British, French and Qatari Special Forces have been operating on the ground in Libya for some time and helped the rebels develop and coordinate the pincer strategy, officials said. At the same time, CIA operatives inside the country — along with intercepted communications between Libyan government officials — provided a deeper understanding of how badly Gaddafi’s command structure had crumbled, according to U.S. officials. Some of the coverage of the war in Libya makes it sound as though a rapid collapse of Gaddafi’s forces followed by a rapid transition to a democracy is a foregone conclusion. Unfortunately this is being very optimistic. Rebel claims that Gaddafi’s forces would all surrender as soon as they took Tripoli as they were “cowards” or only fighting for Gaddafi out of fear have been proven wrong proven wrong by so far three days of resistance by Gaddafi loyalists in Tripoli. Many are fighting on because they fear what the rebels may do to them – and even some rebels fear there may be bloody chaos or civil war between rebel factions if Gaddafi is defeated. The rebels are split on regional, religious (moderate vs hardline fundamentalist Muslims) and tribal lines ;and there are rivalries among different military commanders and politicians for leadership, plus divisions between those who have opposed Gaddafi for decades and those (like TNC head Jalil) who recently defected. 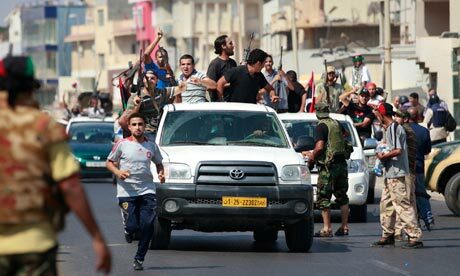 Fighting between rival Islamist factions among the rebels has already happened long before they even reached Tripoli (14). This and the attempted kidnapping of an Australian freelance journalist in rebel held Benghazi by two armed men in military fatigues suggests the TNC either isn’t in control of all the rebels, or else is behavihttp://www.blogger.com/img/blank.gifng similarly to Gaddafi’s forces (15). It’s especially suspicious as Shelton was reporting on Younis’ death (16). Personal rivalries are also a problem. In earlier stages of the war rebel officers sometimes refused even to talk to one another to co-ordinate offensives on towns held by Gaddafi (17). Islamic factions are a big part of rebel military forces. So while Gaddafi’s claims that all the rebels are Al Qa’ida are not true, he seems to be right that some of them are. So there is a serious risk of a Somalia or Afghanistan style civil war with the winners of each round splitting and fighting among one another – and of Libya splitting up like Somalia into two or three separate countries in practice (Somalia currently has Puntland and Somaliland as effectively separate states). The most likely split would be between the three main Italian colonies that made up Libya at independence, which correspond to the three main rebel factions – Cyrenaica in the East (the Benghazi rebels), Tripolitania in the North-west centred on Tripoli (the rebels who defected from Gaddafi) and Fezzan in the South-West(the western Berber and mountain Arab rebels) (20) -(21). Many people have pointed out that Libya does not have the religious, ethnic or cultural diversity of Iraq - but Somalia is overwhelmingly made up of Sunni Muslims from the same nomadic herding culture, but has been in a decades long civil war between different clans and leaders and more recently between those Islamists willing to co-operate with the US against Al Qa'ida and those who refuse to. So civil war in Libya is still a serious risk. NATO's involvement could make this more or less likely. If it aims to keep the rebels unified it could reduce the risk, but in Iraq the US and Coalition forces tended to play on divisions among Iraqis and try to get them fighting and distrusting each other in order to secure the oil laws and contracts wanted by US and other coalition oil companies (see Greg Muttitt's book 'Fuel on the Fire' on this). There is a serious risk of NATO governments doing the same in Libya. There is also the risk of an in Iraq style insurgency either by armed Islamic fundamentalist groups at odds with the other rebels, Gaddafi supporters, or Libyans who don’t support Gaddafi but distrust the rebels due to their close links with foreign governments with ulterior motives (primarily oil contracts and prices more favourable to their firms; increased oil production and exports to benefit NATO countries’ oil importing economies; and control of air bases and ports – the US and Britain having had control of the Wheelus Field air base near Tripoli under Gaddafi’s predecessor King Idris) (22). The insurgency in Iraq lasted long after Saddam’s overthrow and his capture, with more insurgents having been opponents of Saddam than supporters. NATO seem to have managed to organise and co-ordinate the rebel forces far more effectively than in the earlier stages of the war – probably because many NATO special forces, CIA men and French Foreign Legion troops are on the ground advising rebel units – as are NATO ‘private security contractors’ – their usual euphemism for mercenaries – who include former SAS men. Many reports from journalists on the ground in Libya talk of western men who were not keen to be filmed or interviewed – and the Obama administration told congress that CIA operations in Libya could not be overseen by them as they were not military forces (23) – (29) . The "advisers" may actually be fighting - as tens of thousands of American 'military advisers' did in Nicaragua in the 80s on the side of the Contras who backed Somoza, the former dictator. Defence expert Robert Fox has suggested that UAE and Qatari Special forces trained by NATO special forces may have been leading the attack on Tripoli. Whether NATO will be able to prevent rebel factions turning on one another if Gaddafi’s forces are entirely defeated is another matter. It's possible that by making funding and trade deals conditional on rebels staying part of a single TNC NATO governments or the UN might be able to reduce the risk of civil war, but it's not guaranteed to work, especially as other countries such as Russia and China may be backing their own preferred candidates or groups to try to ensure they get oil contracts in Libya too. The civil wars in Afghanistan and Somalia have lasted as long as they have partly due to many different neighbouring governments and world powers backing different factions there. So it’s far too early to be hanging up the Mission Accomplished banner in Libya – and there’s no guarantee that it will lead to democracy, peace and human rights even if NATO achieves it’s aims. http://www.guardian.co.uk/world/2011/jul/29/libyan-rebels-rift-death-younis ; Before the announcement of his death, armed men declaring their support for Younis appeared on the streets of Benghazi claiming they would use force to free him from NTC custody….Minutes after Jalil's statement at a chaotic late-night press conference at a hotel in Benghazi, gunfire broke out in the street outside. Members of Younis's tribe, the Obeidi, one of the largest in the east, fired machine guns and smashed windows, forcing security guards and hotel guests to duck for cover. (10) = Guardian.co.uk 30 Jul 2011 ‘Libyan rebel soldiers killed Younis’, http://www.guardian.co.uk/world/2011/jul/30/libyan-rebel-soldiers-killed-younis ; General Abdel Fattah Younis shot dead by Islamist-linked militia within the anti-Gaddafi forces, says senior opposition minister……. Younis was killed in mysterious circumstances on Thursday. Initially, Mustafa Abdul Jalil, president of the National Transitional Council, the rebel's government, claimed the murder had been carried out by Gaddafi-linked forces…..That was starkly contradicted by oil minister Ali Tarhouni who confirmed Younis had been killed by members of the Obaida Ibn Jarrah Brigade, a group linked to the rebels……Tarhouni told reporters Younis was being brought back to Benghazi when he was shot. A militia leader who had gone to fetch him from the front line had been arrested and confessed that his subordinates had carried out the killing. Increasing evidence has begun to emerge that the savage killings of General Abdel Fatah Younes and two other senior officers – who were shot and whose bodies were burnt – may have been carried out by their own side….Gen Younes, who had himself served as interior minister in the regime, had been accused of holding secret talks with Tripoli officials and leaking military secrets. The news of his arrest led to men from the Obeidi tribe gathering outside the Tibesti Hotel on Thursday evening, where the rebels were due to hold a press conference, threatening to take action to free the commander unless he was released….. Mr Jalil held that Gen Younes had merely been "summoned" for questioning and been released on his own recognisance before being killed in an attack by an "armed gang". Rebel security forces, he maintained, were still trying to find the bodies, but the TNC leader refused to answer questions on how, in that case, he could know that the men were already dead….. Meanwhile Mr Jalil's version of events was contradicted by the TNC's military spokesman, Mohammed al-Rijali, who stated that Gen Younes had been detained at the oil port of Brega and brought to Benghazi for interrogation prior to his death. A third rebel official, a senior security officer, Fadlallah Haroun, maintained that three corpses had already been found before Mr Jalil had made his announcement. He could not explain why the TNC leader had failed to mention this at the press conference. http://feb17.info/news/rebel-leaders-death-puts-eastern-libya-on-edge/ ; At the tribal gathering, Younis’ sons — who didn’t want their names used — say that if the rebel leadership couldn’t bring their father’s killers to justice then they hoped the tribe would….“The way he was killed looks like a betrayal,” says one son, adding that no one is above suspicion….Another son says he believes the rebel council was involved. (17) = Independent 24 Mar 2011 ‘ Kim Sengupta: The resistance has foundered on its own indiscipline and farcical ineptitude’, http://www.independent.co.uk/opinion/commentators/kim-sengupta-the-resistance-has-foundered-on-its-own-indiscipline-and-farcical-ineptitude-2251298.html ;The rebels' operations are further undermined by an absence of command and control. On Monday two men standing within a hundred yards of each other, "Captain" Jalal Idrisi and "Major" Adil Hassi, claimed to be in charge of the fighters who were meant to be attacking Ajdabiya. A brief advance soon turned into a chaotic retreat. Major Hassi then claimed that the misjudgement in going forward had been Captain Idris's idea. But why didn't they liaise? "We haven't got communications equipment" he responded. But the Captain is standing just over there, journalists pointed out. "I don't talk to him," said Major Hassi. (25) = Guardian 31 Mar 2011 ‘Libya: SAS veterans helping Nato identify Gaddafi targets in Misrata’,http://www.guardian.co.uk/world/2011/may/31/libya-sas-veterans-misrata-rebels ; Former SAS soldiers and other western employees of private security companies are helping Nato identify targets in the Libyan port city of Misrata, the scene of heavy fighting between Muammar Gaddafi's forces and rebels, well-placed sources have told the Guardian. (26) = Al Jazeera 03 Apr 2011 ‘Libyan rebels 'receive foreign training'’,http://english.aljazeera.net/news/africa/2011/04/201142172443133798.html ; US and Egyptian special forces have reportedly been providing covert training to rebel fighters in the battle for Libya, Al Jazeera has been told….An unnamed rebel source related how he had undergone training in military techniques at a "secret facility" in eastern Libya. (28) = Washington Post 22 Aug 2011 ‘Allies guided rebel ‘pincer’ assault on Tripoli’http://www.washingtonpost.com/world/national-security/allies-guided-rebel-pincer-assault-on-tripoli/2011/08/22/gIQAeAMaWJ_story.html; British, French and Qatari Special Forces have been operating on the ground in Libya for some time and helped the rebels develop and coordinate the pincer strategy, officials said. At the same time, CIA operatives inside the country — along with intercepted communications between Libyan government officials — provided a deeper understanding of how badly Gaddafi’s command structure had crumbled, according to U.S. officials. Claims made by police spokesmen on BBC News 24 that police are “confused” about what level of force they can use and that this is making it difficult for them to deal with rioters need to be taken with a huge pile of salt. The line they’re pushing is that in the past police have ended up in court for simply trying to prevent crimes. They know that’s a lie. The only police who ended up in court or fired were those involved in the shooting of Jean Charles De Menezes after massive incompetence by senior officers given the power of life and death over others; and others like the officer who repeatedly assaulted bypasser Ian Tomlinson during the G20 protests; the officer who attacked the loud but tiny environmentalist protester Nicola Fisher with a baton (and got off with it) ; and the officer who dragged a prisoner across a police station before throwing her face down into a cell. Others who should be facing charges of grievous bodly harm and endangering lives have got off with it. They include the policeman who beat peaceful student protester Alfie Meadows so hard with a baton that he would have died if he hadn’t had emergency brain surgery – and the officers who tried to turn the ambulance carrying him away from the nearest hospital as protesters being treated in the same hospital as injured police offended their sensibilities (presumably on the usual theory held by the stupidest and worst police officers that all protesters are criminals). Some police spokesmen are trying to use the riots to reverse planned job and funding cuts. That’s fair enough. I support increasing the number of police and i'd guess most people do. However they’re also using them to try to demand a blank cheque to use any amount of force they feel like in any situation and to try to get the public to place them above the law. That won’t wash. If they’re confused about how much force they can use when they’re not up to the job – they can use what the law allows – the amount required to defend themselves and others and to prevent serious crimes – and no more. No blank cheques to beat up anyone they like. The initial rioting in Tottenham seems to have been caused by police shooting Mark Duggan (who may or may not have been armed but we now know definitely did not fire first – or at all) and by fifteen riot police subsequently beating a single 16 year old girl who was one of a large group of family, friends and neighbours of Duggan demanding answers from them, after she threw a leaflet and possibly a stone. That underlines the fact that giving the police a blank cheque to do as they please and believing them without question (even though their spokespeople lied about De Menezes , Tomlinson and other cases) will not make the public safer or reduce crime, but is likely to cause it instead. 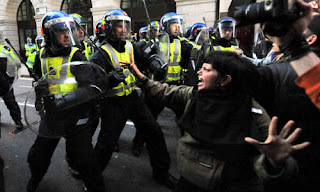 The police know that when they act in self-defence or the defence of others with the amount of force necessary in the situation they’ll have public support and be acting within the law. They have to be in no more doubt than the rioters that they can’t launch random attacks on people or break the law without facing consequences. If the police were allowed to be above the law, it would only breed contempt for it and them, which would be bad for everyone. The riots across London and other English cities have obviously involved a lot of opportunist theft and violence many actions that can’t be justified in any way, like the burning of public housing and three men run over and killed by a hit and run driver in Manchester – and far from it all being children out of control, there are plenty of looters in their 20s and some parents sending their children to loot shops according to eyewitnesses. 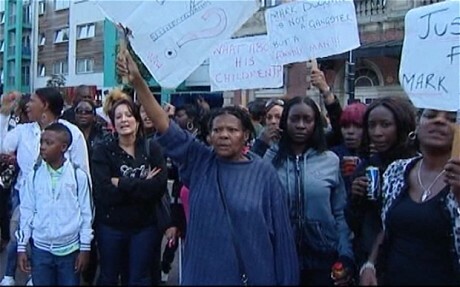 The shooting of Mark Duggan doesn’t seem to have been the only spark that started the first riots, in the Tottenham area of London, though. Reports by eyewitnesses quoted on the Guardian website say that after Duggan was shot and killed by armed police, Tottenham community leaders and Duggan’s partner, family, friends and neighbours, among others, came on to the street to demand to know exactly what had happened. Hours later, with no answers provided, a 16 year old girl approached a line of riot police saying “We need answers, talk to us” and throwing a leaflet and possibly a stone at them. 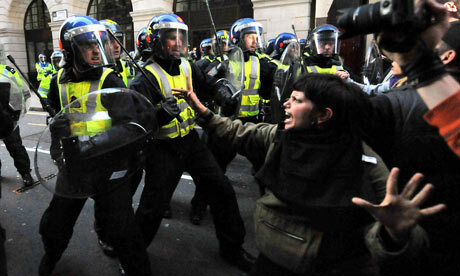 Fifteen riot police then jumped on her with shields and batons and began to beat her, triggering a riot (1). Various eye-witnesses all agree that the initial gathering in the street was peaceful. Some claim some of the group were armed and carrying petrol, ready for looting and burning, though others deny this (2). The media has quoted Metropolitan police spokespeople as saying Duggan was a “well-known” “major player” (i.e senior gangster) who was armed with a gun at the time he was shot (3). This might be true. Or it might not. Metropolitan police spokespeople have said many things that turned out to be completely untrue about people they’ve shot the wrong people dead in the past, most notably Jean Charles De Menezes, the Brazilian electrician shot as a suspected suicide bomber in in an operation involving unbelievable levels of incompetence, carelessness and stupidity from people trusted with the powers of life and death over others. Met spokespeople claimed De Menezes ‘jumped the ticket barrier’ on entering an underground station (CCTV footage and eye-witnesses disproved this), claimed he was wearing a bulky jacket with wires coming out of it (again proven false) and that police had called in medics by helicopter to try to revive him after the shooting (which seems pretty unlikely since they’d shot him 8 times in the head). Similar lies by police came in the case of Ian Tomlinson, a newsagent walking home, who was ‘kettled’ along with (mostly peaceful) G20 protesters after a handful of protesters smashed a bank window. Police then set a dog on him and one officer hit him with a baton and shoved him twice, resulting in his death. They then invented stories about protesters pelting them with bottles as they tried to save the life of Tomlinson, who had supposedly had a heart attack due to the protesters’ actions. They went on to employ a coroner known to be dishonest to deal with the post-mortem. (In this case the policeman involved was eventually fired). This does not prove they are lying about Duggan having had a gun, but it means the word of the police can’t be automatically trusted and we have to wait for a full investigation to find out the facts. Initial investigations by the Independent Police Complaints Commission have found that the police’s original claim that Duggan was shot after firing on armed police officers is wrong. IPCC investigators found the bullet lodged in one officer’s radio, which Duggan had supposedly fired, was a police issue one, not the kind of ammunition in the gun they claim Duggan had (4). This suggests that the police fired first, the police were the only ones who fired ; and at least one police officer lied about this, though it’s possible other police genuinely believed Duggan had fired the shot that hit the radio. We can’t be certain whether either side is telling the truth or the whole truth here of course, about the shooting or the beating, but given the extremely poor record on honesty of Metropolitan Police spokespeople, anyone taking claims as fact without waiting for an inquiry will be relying on a source that has proven less than reliable in the past. The myths that Muslim immigrants are taking over Europe and that multiculturalism is harmful caused the murders in Norway. As in the 1930s the real threats to democracy are irrational hatred of minorities and the mass unemployment which is increasing them. There is a dangerous myth being spread by the hard right in the UK, Europe and in the US – that Muslims are on their way to taking over Europe through immigration and high birth rates which will result in them outnumbering non-Muslims and imposing Sharia law on us all (1) – (5). The Norwegian lunatic Anders Behring Breivik who shot dozens of teenagers is one of millions saying he opposes “multiculturalism” and “an Islamic takeover of Europe” or “Islamisation”. He says he targeted the Norwegian Labour party for being “traitors” by allowing immigration (6) – (8). These myths are being spread not just by the far right but by columnists in mainstream newspapers, tabloids and magazines. They’re also being pandered to and repeated by many senior members of mainstream parties of the centre-right and centre-left in order to get easy votes – and held by some of their smaller coalition partners. These beliefs are a much greater threat to democracy in Britain and Europe than Islamic extremism is because they are held by a much larger and faster growing proportion of the population. As a result the far right have made electoral breakthroughs and the main parties have adopted some of their policies and rhetoric, making more people believe them. These false beliefs have increased during the current recession due to governments and media owners looking for scapegoats to avoid taking the blame themselves, just as similar myths and hatred against Jews, gypsies and immigrants did during the Great Depression of the 1930s, but they have never really gone away – they’ve just switched targets. The ‘Islamisation’ of Europe myth is that Muslims are going to take over Europe by becoming a majority through immigration and a higher birth rate, then imposing Sharia law on everyone. While a few Muslim extremists in the UK have talked of outnumbering non-Muslims by having lots of children, the figures and research show the Muslim takeover theory would be funny if it wasn’t so widely believed and so dangerous (9). 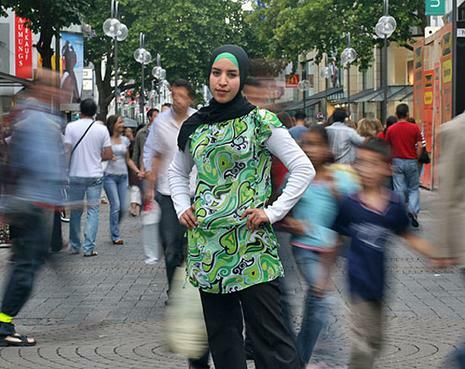 The Pew Research Center in the US found that between 1990 and 2010 the Muslim population of Europe rose from 26 million to about 41 million (and that’s for the whole of Europe – including Eastern European countries outside the EU – e.g Bosnia, Albania and Kosovo). However since this was a small minority of the total population and many immigrants are not Muslims the rise was from 4.1% of the population of Europe to 6% (10). Since Pew also found that birth rates among Muslims globally and in the EU have been falling fast over those 30 years there is no prospect whatsoever of Muslims becoming a majority in the EU (11). Muslims are also a minority of immigrants - just 28% of immigrants to the UK in 2010 were Muslims and only 13% of those to Spain – with the average rate for the 14 EU members listed by the Pew report being 28%. The only country with more Muslim than non-Muslim immigrants is France, with 68.5%, because of it’s links with it’s former North African colonies in Morocco and Algeria (12). Despite the myths, the only countries with which EU member states have uncontrolled immigration are other EU member states – and uncontrolled immigration only applies to people with EU citizenship, not asylum seekers or migrant workers who are not citizens of an EU country. EU member states’ immigration policy on immigration from outside the EU and on illegal immigration has also become harsher due to EU agreements, not softer (13). So a large proportion of immigrants to EU countries come from other EU countries, none of which have a Muslim majority or anything close to one. 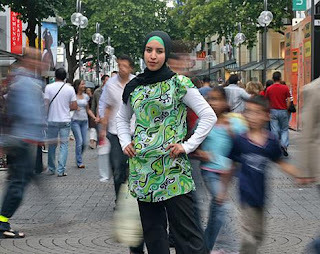 The non-Muslim majority of immigrants from outside the EU and from poorer EU countries to wealthier ones tend to have high birth rates, just like the Muslim minority of immigrants from outside the EU (14) – (16). The only fact the anti-immigration and anti-Muslim arguments have on their side is that overall birth rates among the non-immigrant population are too low to even maintain the existing population sizes of EU countries without continued immigration. However the effect of this is reduced by the tendency for the children of immigrants to have less children, falling by the second or third generation (on average) to no more children than average for the existing population (i.e falling towards less than two children per couple) (14) –(16). Research in Europe confirms that the children of Muslim immigrants have less children than their parents did - showing that from the second generation on birth rates among Muslims fall to similar levels to non-Muslim natives – and that includes the Netherlands, despite what Geert Wilders claims (17) – (19). (Credit here to the Yellow Stars Euro Blog post ‘Islamification Myth’ ). Then there’s the false assumption that most Muslims living in and migrating to Europe are extreme fundamentalists who believe in a Taliban or Saudi Arabian version of Sharia law and sympathise with Al Qa’ida, based on demonstrations by handfuls of extremists. In fact, while polls show a higher proportion of Muslims are strongly religious than the average, a poll of British Muslims in 2006 found that more opposed Sharia law (41%) than supported it (40%) – though you wouldn’t have known that form the Telegraph newspaper’s headline which only mentioned the second figure (23). There are also many interpretations of Sharia law, with a great deal of debate even among devout Muslims as to which parts of the Koran and other Islamic texts apply to the modern day and which don’t and on whether Sharia should adapt to present customs or not. Some of the more liberal interpretations by Muslim scholars say ‘ijtihad’ (interpretive reasoning) can be used by Muslims to decide how to apply Islamic principles in the present to particular situations. Many interpretations are much less extreme than the Taliban’s or Saudi Arabia’s and don’t involve beheadings, stoning for adultery or cutting off the hands of thieves (24) – (25). (I am certainly not advocating Sharia law here, just pointing out that not all Muslims who support Sharia are extremists supporting stoning, beheadings and amputations). The 2006 poll also showed that 99% of British Muslims believed that the London bombings were wrong and “an atrocity” (26). Even in the hugely unlikely event of any EU countries having a Muslim majority they might well not implement Sharia law anyway. Neither Bosnia, Kosovo, nor Albania have Sharia law despite having majority Muslim populations ; Nor does Turkey, with an Islamic party having been in government for over a decade. Even if Turkey were to gain membership of the EU ( which is very unlikely to happen) most Turkish Muslims are less than fundamentalist, drinking alcohol, cutting or shaving their facial hair and eating pork for instance (27). 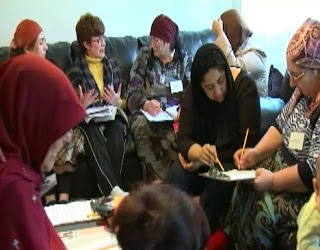 Another dodgy assumption made by the anti-Muslim-ites is that Muslim immigrants and their children and grandchildren and great grandchildren will all remain devout Muslims and will not inter-marry with or be influenced by the non-Muslim majority they live among. This seems highly unlikely based on past waves of immigration such as Irish immigration to the UK in the 17th to 20th centuries (which was often accompanied by hysteria from many Protestants about how this could allow a Catholic takeover, with Catholicism imposed on everyone by the Irish through immigration and high birth rates). Later generations have tended to be less religious and to have smaller families as their education and income levels rose and they had more contact with non-Catholics. (I’m using the term ‘anti-Muslim-ites’ rather than ‘Islamophobes’ because their beliefs are as prejudiced against all Muslims, as irrational and as full of hatred as anti-Semites’ hatred of all Jews). The same would seem likely to happen with how religious second and later generations are, though bigots and hate mongers like the British National Party, the English Defence League and Breivik have created a reaction among a minority of European Muslims who have reasserted their identity more forcefully in a refusal to be intimidated. Extreme Bosnian Serb and Croatian nationalist attacks on Muslims in the Bosnian war similarly led to a growth in fundamentalism among a Muslim population who previously were happy to celebrate Christmas and drink alcohol (most still are). So there is no reason to think that immigration to Europe by Muslims will ‘destroy society’ and lead to the ‘native people’ being overwhelmed any more than many previous waves of immigration. Many of these involved violent raiding, murders, rapes and all out war and invasion by people of different religions (for instance the Celts, Romans and Saxons all worshipped different Gods and had significantly different cultures and languages – and the Normans and Vikings had different languages and cultures from the Anglo-Saxons). The current waves of immigration are non-violent and controlled by EU governments – most violence involved is by immigration officers or private security guards involved in forcible deportations. The numbers of immigrants are certainly greater than in the past due to higher global population and birth rates and modern transport, but the technology and organisation of controls on immigration are also more advanced and birth rates have been falling for over a decade even in most of the higher birth rate countries. The real danger is that the extreme right will either get into government again across Europe through a mixture of irrational hatred of all Muslims and immigrants and mass unemployment and poverty caused by austerity policies; or else mainstream parties will continue to go further and further in adopting the policies of the extreme right to keep power (as many already have), rather than challenge and defeat them by reducing the real cause of the problem – unemployment. The Norwegian mass murder Breivik’s ideology is part of a growing global extremist movement with far more believers than Al Qa’ida has ever had, comparable to global anti-Semitism and fascist movements during the Great Depression. A large minority of European and American politicians and newspaper editors have argued that while Breivik’s actions were insane, his beliefs are valid. For instance Francesco Speroni, Chief Whip of the Italian Northern League party in the Italian parliament and former minister in one of Berlusconi’s coalition governments has said that “Breivik's ideas are in defence of western civilisation”. Speroni is an admirer of the late Oriana Fallaci, an Italian journalist and author who popularised the supposed threat of ‘Eurabia’ – Islamisation and Arabisation of Europe (28). 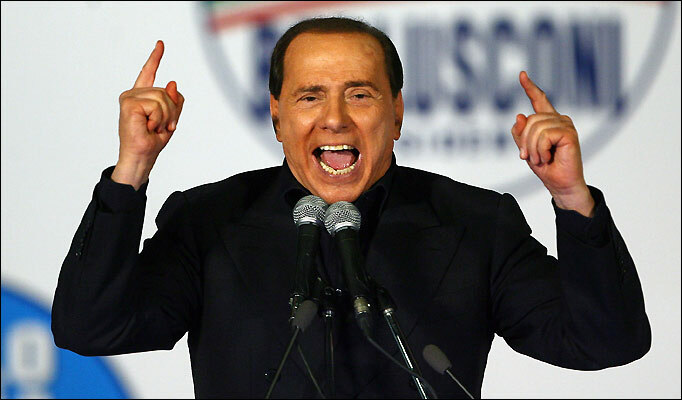 Italian MEP Mario Borgezio, a member of Prime Minister Berlusconi’s coalition partner party the Northern League, has said that “Some of the ideas he expressed are good, barring the violence. Some of them are great” (29). 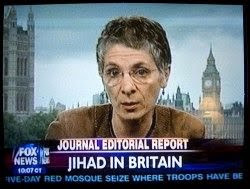 Breivik’s condemnation of multiculturalism and the supposed ‘Islamisation of Europe’ echo many articles by right wing American commentators like Daniel Pipes in the US and former Daily Mail columnist Melanie Phillips in the UK. Breivik quoted an entire Phillips article from the Daily Mail in 2009 in his online manifesto. In it Phillips claimed the British Labour party in government had allowed unrestricted immigration (false – there were for instance many deportations of black Zimbabweans back to torture or death at Mugabe’s hands, just as under the Conservatives) and that Labour had done this in order to deliberately “destroy British society” to get the votes of immigrants (30) – (31). In 2002 Phillips wrote that “Multiculturalism is predicated on the idea that all faiths are equal; but …if enfeebled Christianity no longer identifies itself as the spiritual pastor of the culture…Islam will move into the vacuum.” And that “The question the multiculturalists have to answer is..: are we a western culture, or are we to become something else? If the latter, who is making the decision to wipe out our national identity? Because if we take in enough people who refuse to assimilate to western values, this belief system will not survive.” (32). She has had many similar rants since on her website here and in her book ‘The World turned upside down’. Surprisingly this book is about how the Muslims and the immigrants are taking over due to political correctness gone maaaad. Bruce Bawer, the American author of one of many fear-mongering books on ‘Islamisation’ called ‘While Europe Slept: How Radical Islam Is Destroying the West from Within’, had a comment piece published in the Wall Street Journal in which he claimed Breivik had “legitimate concern about genuine problems” such as “the rise of Islam in Europe”. Bawer notes that Breivik had quoted his book 22 times in his online manifesto. (33). Former senior Republican congressman Newt Gingrich (who is running to be the Republican Presidential candidate) has said that America is in danger of becoming a “secular atheist country, potentially one dominated by radical Islamists and with no understanding of what it once meant to be an American.”. Gingrich is clearly playing to the Islamisation myth here, similarly to Phillips – that if we aren’t all right wing Christian fundamentalists the Muslims will take over - but applied to the US (34). American politician Pat Buchanan, a former member of the Nixon administration, has also written pieces claiming that the Islamisation of Europe which Breivik fears is a real threat (35). Both Bawer and Buchanan praise Brievik’s supposedly deep knowledge of European culture and history and his “intelligence”. Breivik also talked online of his contacts with the far right English Defence League which also says it opposes ‘Islamisation’ and ‘multiculturalism’ – and online posts by EDL members said he’d given talks and been to demonstrations with them in the UK (36). The role of Pamela Geller of the Tea Party wing of the US Republican party in spreading anti-Muslim hatred and opposition to multicultural society in Norway is so great that I’m making a separate post on it, but note here that Breivik often posted on Geller’s blog and read her posts (including one claiming all rapes in the past 5 years in Norway were committed by Muslims) and that Geller held rallies against ‘Islamisation’ and ‘multi-culturalism’ in Norway. Geller also blames “the Euro-Med policy” for “inciting” Breivik. 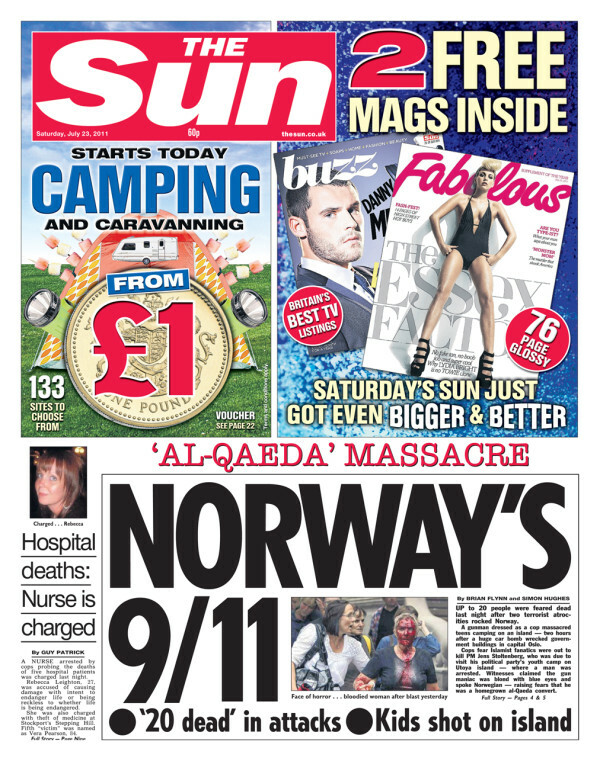 Murdoch’s Sun newspaper didn’t bother waiting for the facts on the Norway attacks, but went ahead and published a front page claiming it was ‘Norway’s 9/11’ and an ‘Al Qaeda massacre’. President Sarkozy’s mass forced deportation of gypsies, who are EU citizens born in the EU, from France, to try to avoid losing votes going to the French National Front, is one chilling example of mainstream parties adopting far right policies (37) – (38). The Nazis and the Vichy French collaborators sent gypsies to the concentration camps along with the Jews during the Second World War. 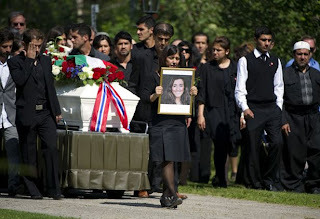 There are some genuine problems with crimes by some gypsies, just as there are some extreme fundamentalists and a tiny number of terrorists among European Muslims, but this does not make prejudice against all gypsies or Muslims acceptable any more than it would be acceptable to blame all white, Christian, Europeans for Breivik’s actions. It’s prejudice and political hate and fear-mongering. 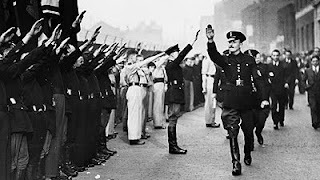 Anti-semitism – hatred of Jews was as widespread and socially acceptable in Europe, Britain, the US and Canada in the 1930s and even during World War Two as prejudice against all Muslims and immigrants is now (40). It was accompanied by hatred of immigrants (many Jewish) and gypsies. It continued even up until the Holocaust was revealed in full after World War Two. Then, too, it was mostly the far right who hated the minorities, not the left, with Communists in London fighting Mosley’s fascist anti-Semitic blackshirts who modelled themselves on the Nazis. While some serious anti-Semitism remains, hatred of Muslims and immigrants has become more common. The Conservative party in the UK, including Prime Minister David Cameron, have also pandered to the far right by claiming that “multiculturalism has failed” – a claim echoed by Sarkozy in France and Merkel in Germany (41) – (43). To the bigots and the unemployed who blame them for the loss of their jobs the word ‘multiculturalism’ means two things – allowing foreigners with different skin colours and religions into our countries and allowing them to marry Christians and white people. Breivik shot dozens of teenagers dead to punish them for supporting ‘multiculturalism’. 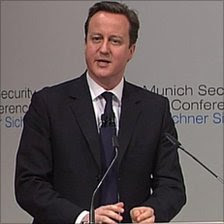 Nick Griffin, the leader of the neo-fascist British National Party, was over-joyed at Cameron’s speech, calling it “A further huge leap for our ideas into the political mainstream” and adding that “A few years ago we had the then Labour Home Secretary David Blunkett admitting that ‘multiculturalism has failed” (44). It has not failed though. People of different religions and races can mostly get on with each other, do business, be friends, marry one another and influence each other culturally as equals – and both sides tend to learn and gain from the interaction, getting the best ideas and traditions from each culture. The alternative is a slide towards defining only white Christians as being true Europeans – and that has led to genocide and world wars in the past. To be fair what Cameron, Sarkozy, Merkel and Blunkett mean by 'multiculturalism' is different cultures, religions or races living entirely separately from one another, but this is more the result of unemployment leading to less contact between communities than of any new failure to integrate. It also fails to take into account the fact that past waves of immigrants have taken time to integrate into society as their children, grandchildren and great grandchildren come into more contact with people of religions and cultures different from their parents. Some of the same politicians talking about the problems of 'multiculturalism' have also strengthened it by supporting faith based schools which hinder the normal process of integration through going to the same schools. Encouraging integration by offering e.g free English classes and community centres and evening classes is fine, but the idea that people should be 'made' to integrate is verging on fascism. How much or how little people want to be involved with others and in what ways are up to them, whether they're immigrants or not. The same goes for imposing one version of what it means to be British or French or German on everyone and demanding they all adopt it. Though we could yet avoid it, we are risking heading towards a situation like the one in the Great Depression where anti-Semitism against Jewish immigrants and hatred of gypsies combined with austerity policies to lead to fascism, though this time the targets of opportunity for the hate mongers are Muslims and immigrants. 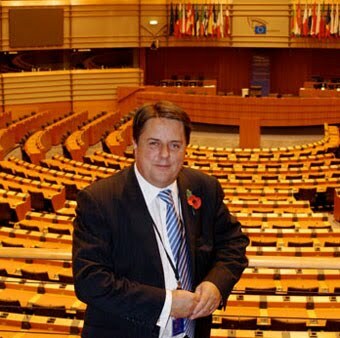 The leader of the British National Party and a second candidate – Andrew Brons – were elected as members of the European Parliament in 2008. Griffin had previously written of the “courage” and “sacrifice” of the Waffen SS and in 1998 told a court that the Holocaust never happened and was a mixture of “lies” and propaganda”, while Brons had been a member of the British National Socialist Movement and used to chant “death to Jews” at rallies (45) – (47). After September 11th though Griffin and his party renounced those views, realising that it was now more popular to spread hatred of Muslims than to spread hatred of Jews. The party changed it’s rules to allow Jews to become members and reversed it’s rhetoric on Israel from unthinking hatred to unthinking and unconditional support for the Israeli government, including Griffin boasting of his support for the Israeli ‘Operation Cast Lead’ which killed over a thousand civilians. Similarly Gianfranco Fini, who between 2001 And 2004 held the posts of Deputy Prime Minister and Foreign Minister in the Italian government, was famous in the 1980s through to 1994 for his proud boast that his MSI (Italian Social Movement) party was a fascist party led by the proud heirs of Mussolini who “was the greatest Italian statesman of the twentieth century”. Yet by 2003 Fini had travelled to Israel to apologise for the shameful way Italian Jews were sent to the German concentration camps by Mussolini’s fascists – and in 2009, as President of the Italian parliament, Fini said that protesters in Turin burning Israeli flags was “far more serious” than a neo-fascist gang beating a man to death (48). This is clearly more political opportunism than any kind of change of beliefs at work. When challenged during a BBC debate on his past Holocast denial, Griffin merely answered “I can't tell you why I used to say those things anymore than I can tell you why I have changed my mind” (49). I think I can. After September 11th it became more popular to blame all Muslims for the actions of Al Qa’ida than to try to blame all Jews for some of the actions of the Israeli government and military, so Muslims became the new targets of opportunity along with immigrants and gypsies. The real threat to democracy and European and national values of tolerance comes from the extreme right and the growing belief in the myths that they spread. This is made worse by mainstream parties seeming to give credibility to many of these myths by competing to by “tougher on immigration”, by their demands that European Muslims “deal with the extremists in their midst” as though Muslims were all responsible for Al Qa’ida (note no similar calls for Christians to sort out the extreme fundamentalists in their midst after the Norwegian attack by a Christian extremist) and by their constant references to the British National Party and other hard right extremists as if they were the only alternative to the big parties, ignoring Green parties, socialists, Independent candidates and others. It would be interesting to see a poll of non-Muslims in the UK, Norway or Europe on how many sympathise with the motives of the Norwegian lunatic and how many think his actions were justified. Given the levels of support for the BNP, the English Defence League and others the results would probably give much more cause for concern. Geert Wilders extreme right ‘Freedom Party’ in the Netherlands won more seats than one of the major parties – the Christian Democrats – in a 2010 election campaign run with adverts showing women clad in burkhas getting pensions before white Dutch women, who were left with none (50). This threat is made more serious by mass unemployment, welfare cuts and 1930s style austerity policies which risk a second recession. Unemployment, not immigration, has always been the main factor boosting support for the hard right. When the last textile factories in the North of England closed in the late 90s there were race riots in the towns of Oldham, Bradford and Burnley where the factories had been - and the vote of the BNP rose, getting them several council seats (51) – (52). After the current recession the BNP increased its vote and had MEPs elected for the first time in the UK and since the 2010 elections in the Netherlands the government is reliant on the ‘Freedom Party’ for majorities in votes. Sarkozy’s government in France and Berlusconis in Italy have also become increasingly anti-immigration in their policies and rhetoric and neo-fascist parties like Fini’s ‘Future and Freedom’ party have been part of the governing coalition in Italy for most of the period since1994. The current rise of the far right parallels the rise of the Nazis in German during the Great Depression (pointed out by Aneurin Bevan in his book ‘In Place of Fear’ which my blog is named after), in terms of free trade and reduced welfare and public sector employment having led to rising unemployment, with minority religious groups and immigrants used as scapegoats, leading to the rise of the far right. Bevan showed that the vote for the Nazi party in Germany from 1924 to 1933 rose and fell as the numbers of unemployed did (Bevan 1952 – Chapter 1, note I). In the 1928 elections when unemployment was around 1.3 million the Nazis won only 12 seats in the Reichstag. In 1932 when unemployment had risen to 5.6 million they became the largest party with 230 seats. (Unemployment figures are from Bevan, election results from this BBC history page) (53) – (54). Current austerity policies in Europe and Republican party obstruction of Obama’s and the Democrats’ attempts to create some kind of new New Deal to create jobs and economic growth again are risking not only a second recession but also boosting the far right again as a result of even higher unemployment. We have to put pressure on our governments to change policy in case they end up repeating the mistakes of the 1930s. (46) = BBC 25 Nov 2000 ‘Panorama : Under the Skin’, http://news.bbc.co.uk/hi/english/static/in_depth/programmes/2001/bnp_special/roots/1998.stm ; Griffin told a court in 1998 that “I am well aware that the orthodox opinion is that 6 million Jews were gassed and cremated and turned into lampshades. Orthodox opinion also once held that the world is flat... I have reached the conclusion that the 'extermination' tale is a mixture of Allied wartime propaganda, extremely profitable lie, and latter witch-hysteria."